The AST-IS standard transmitters contain a non-dispersive, infrared sensor for accurate and reliable, indoor, carbon dioxide (CO2) detection and are available in 3 models with different options. All models are low maintenance and a key component for climate control of buildings and other processes. AST-AS1 is a simple, low-cost, transmitter without a display for fixed installation in the climate zone. AST-IS5 measures both CO2 and temperature in the ambient air, has a display and can transmit data to a BAS system or controller. 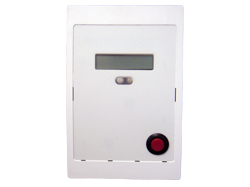 AST-IS14 features a display and has an alarm with sound and light that alerts when the levels of CO2 exceed defined levels. The AST-IS standard transmitters feature 4 - 20 mA or 0 - 10 VDC linear output signals, low 24 VDC / VAC nominal voltage, standard 0 - 2,000 ppm range and CE certification.